Pictures of what could be the Moto C, have been leaked on Chinese social network Weibo. This could be an upcoming entry level phone from Motorola-Lenovo. We don’t have any information on the device, but here are our speculations, The device appears to have a small form factor so we could possible expect a 5.0 inch or 4.5 inch display. The icons on the phone resemble that of Moto's usual stock Android like interface, with the Google launcher on it. The back panel has a single speaker grille, in the form of a series of holes. But the rest of the design, including the camera with the single LED flash, does resemble that of the Moto G5/Plus and Moto M. The only oddity in the photo, is the single SIM card indicator on the status bar. Usually, all Phones in Motorola's portfolio have dual SIM Cards. The Moto C can be seen in 3 colours: Black, Gold, and Red. With the possibility of a Moto E4 Plus launch rumour floating around, we are befuddled by the existence of another entry level phone, in the Moto C. Are they both the same phone? We are not sure about this. The only thing we can say for certain is that it is impossible that this phone is a China variant, as Google services are banned in the Country, and you can see almost 10 of Google's apps in the press render. Update: No, this is the Moto C. And the Moto E4 is a completely different device, more about this in our next article. 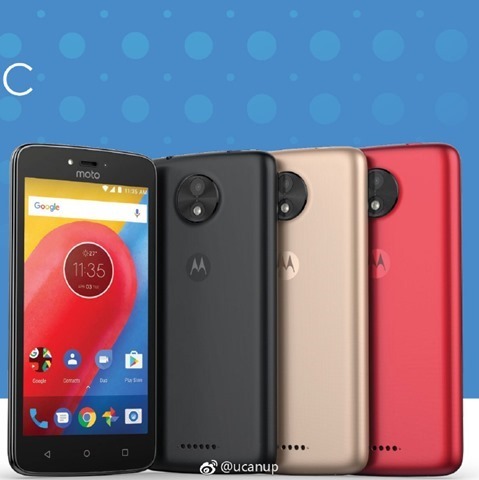 Moto C photos leaked on Weibo. And here are our sepeculations on what could be an entry level phone.